A proxy server is a server located between the client computer and the actual server on the Internet. The proxy server plays the role of intercepting each request to the requested server and control access to the desired Internet address. If this is not possible, then the proxy forwards the request to another server. When using enterprise proxy server, in addition to Internet access, i.e. its main role, also has the function of ensuring control and security. Being a gateway server, proxy server plays the role of separating the enterprise network from other networks. Internet proxy server is also associated with the function of the firewall that used to protect the enterprise network from any intrusion. Internet proxy server, receiving requests from the web or any other Internet users, checks them for compliance subject to a given filtration. When all conditions are met, the proxy server checks its cache for the requested page (in this case, if the proxy server is the cache server). If the web page is sent to the query are found, they are returned to the user. In this case, there is no need to proxy server, as in the tool to forward the request. 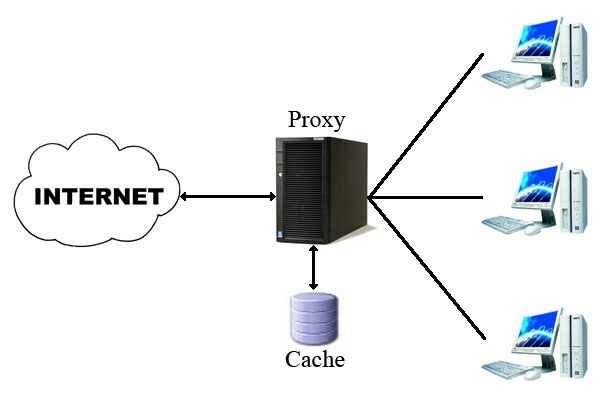 If the page could not be found in the cache, the proxy server acts as a client using their IP address requesting the web page from other servers located on the Internet. In the visual perception of the user, the proxy server does not seem to exist. This is because sending the request and receiving the response are very fast. The user think that they are made directly from Internet server. There are two main reasons for using proxy servers. One of them is improving performance and filtering requests. Internet proxy server can improve performance for users because it keeps all the queries created by the user, making browsing the Internet much faster. The second reason to use a proxy server filtering requests can be viewed in schools or in the workplace. In this case, students or employees may be denied access to certain Internet sites. This is accomplished by configuring the proxy server. Proxy servers differ in the level of anonymity or transparency by hiding the real IP address of the client. Transparent web proxy – when the proxy server by sending a request to the destination server, open shows, what is a proxy server. In addition, he does not hide the IP address of the client. Anonymous web proxy does not hide the fact that they are proxies, but they do not broadcast IP address of the client. There are also proxy servers that reveal its status as a proxy, but using a different IP address, different from the actual.